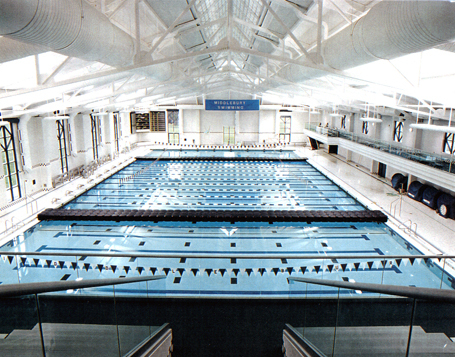 The Peterson Family Athletic Center is a comprehensive athletic facility, complete with an indoor 50-meter, 10 lane competition pool and natatorium which includes a bulkhead, one-meter and three-meter diving structures, gallery seating for 600 spectators, and a 2,300-seat hockey arena. The natatorium was designed by Counsilman Hunsaker & Associates in association with Moser Pilon Nelson Architects. This facility was featured as an Architectural Showcase in Athletic Business Magazine in June 2000.